I am very pleased to announce the creation of the New York Dyalog APL Meetup group, details of which can be found online at https://www.meetup.com/New-York-Dyalog-APL-Meetup/. The meetup has been created and is organised by Paul Mansour, who is also sponsoring the venue for the inaugural meetup, scheduled for 6-9pm on Thursday February 7th, at Alley, 119 West 24th Street, New York. 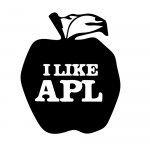 If you are interested in meeting APL users in the New York area, please join the Meetup group so that you will be notified of future events. Please sign up for events that you intend to attend so we know you are coming! Meetup is a service used to organize online groups that host in-person events for people with similar interests, including programming languages. In addition to the New York group, there is also an APL Meetup group in Frankfurt which meets regularly. We welcome the creation of more local meetups! If you create one in your area, remember to inform us at Dyalog so that we can add a link from our event calendar, and arrange to stop by and speak when we are in your neighborhood! When you are busy solving problems, new technology can be an unwelcome distraction – but every now and again technologies appear which have the potential to make development, maintenance or distribution significantly easier. Morten will demonstrate some of the new ways of working with APL that have become available in the last few years, and also discuss likely features in the next couple of releases of Dyalog APL: 17.1 in Q2 of 2019 and 18.0 in 2020. 8:15-9:00 Paul Mansour: Keeping it Simple – A Git Workflow for APLers. Abstract: Git is great, but the newcomer can easily drown in a sea of commands and options. Git doesn’t tell you when or why to branch, when or why to merge or rebase, how to version your project or prepare a release. AcreFlow is a radically simplified Git workflow that answers these questions. It is implemented in Dyalog APL so you can branch, commit, and put out new versions directly from the APL session. 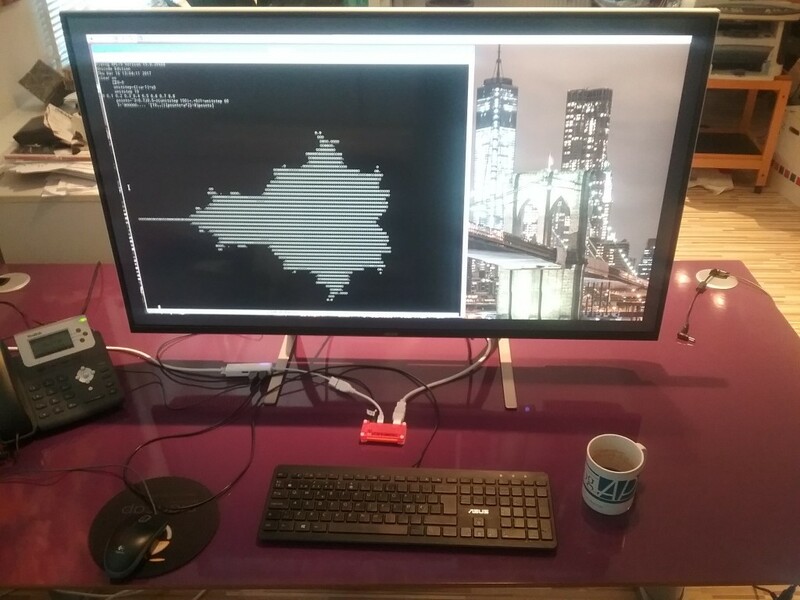 Finally, the last accessory I ordered for my Raspberry Pi Zero (that’s the little red thing behind my keyboard) has arrived – an Acer 43″ ET430K monitor. The Zero won’t quite drive this monitor at its maximum resolution of 3840×2160 pixels, but as you can see, you get enough real estate to do real graphics with “ASCII Art” (well, Unicode Art, anyway)! Some readers will recognise the image as the famous Mandelbrot Set, named after the mathematician Benoit Mandelbrot, who studied fractals. 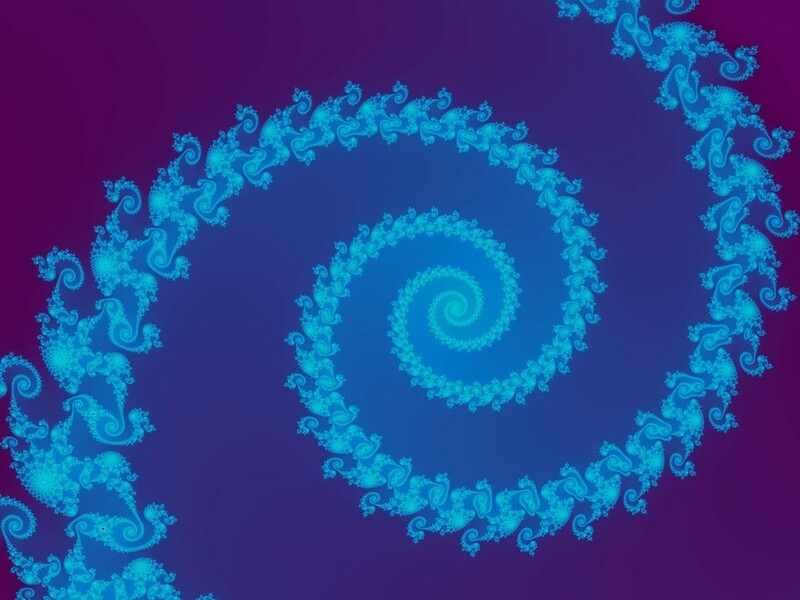 According to Wikipedia a fractal is a mathematical set that exhibits a repeating pattern displayed at every scale – they are interesting because they produce patterns that are very similar to things we can see around us – both in living organisms and landscapes – they seem to be part of the fundamental fabric of the universe. The colourful images of the Mandelbrot set are produced by looking at a selection of points in the complex plane. For each point c, start with a value of 0 for z, repeat the computation z = c + z², and colour the point according to the number of iterations required before the function becomes “unbounded in value”. If you are not familiar with complex numbers, those results may look a bit odd. While complex addition just requires adding the real and the imaginary parts independently, the result of multiplication of two complex numbers (a + bi) and (c + di) is defined as (ac-db) + (bc+ad)i. Geometrically, complex multiplication is a combined stretching and rotation operation. Above, I used an anonymous function so I could pass the number of iterations in as a parameter, and use the each operator ¨ to generate all the results up to ten iterations. In this case, we can see that the magnitude of the result stabilises, which is why the point 0.1 + 0.1i is considered to be inside the Mandelbrot set. Points which are just outside the set will require varying numbers of applications of f before the magnitude “explodes”, and if you colour points according to how many iterations are needed and pick interesting areas along the edge of the set, great beauty is revealed. The above image is in the public domain and was created by Jonathan J. Dickau using ChaosPro 3.3 software, which was created by Martin Pfingstl. The result is subtracted from 0.7J0.5 (0.7 + 0.5i) to get the origin of the complex plane slightly off centre in the middle, and multiplied the whole thing by 3 to get a set of values that brackets the Mandelbrot set. The last example allowed me to sneak in a preview of the new “at” operator coming in Dyalog v16.0. It is a functional merge operator that I am using to insert the formatted right argument (the number of iterations) into position (0 0) of each matrix. 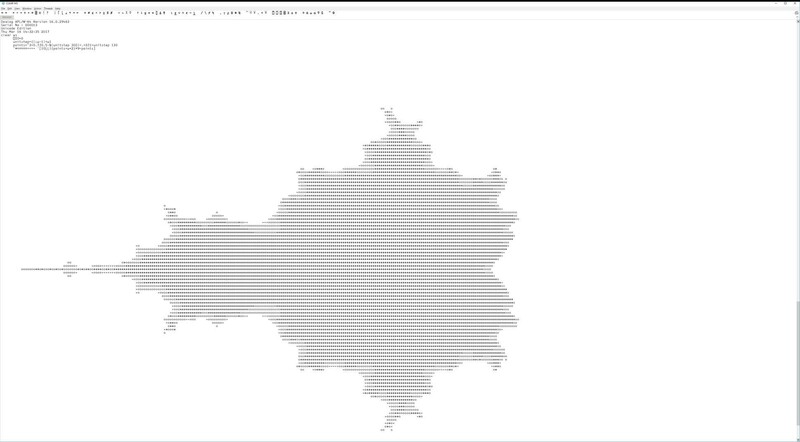 The original ASCII chart simply plotted the observations in the order that they occurred. Above, the shaded areas show how many observations there were in each bucket (2 between 250ms and 275ms, 3 between 275ms and 300ms, and so on). At the same time, the individual observations can be seen along the X axis as vertical red lines. It is a little unfortunate that, presumably due to some artifact of the timing process, the values 251 and 294 occur twice – and these lines are drawn on top of each other. 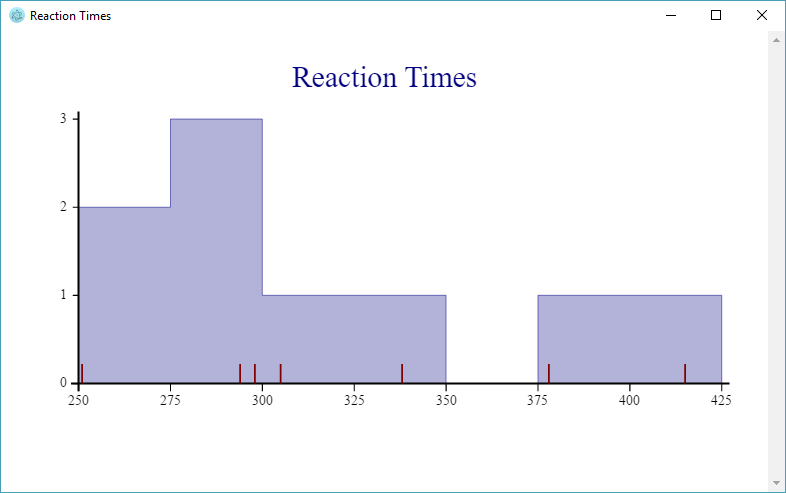 The example highlights one of the things that makes SharpPlot a bit special: We have overlaid a histogram showing the frequency of reactions in each bucket, and used a “scatterplot” to where the Y value is always 0, to mark the individual observations along the X axis. Hopefully the code is more or less self-explanatory, but if you’d like to learn more about SharpPlot there is excellent documentation at http://sharpplot.com. The documentation is actually written for C# users, but there is an illustration of how to translate the documentation to APL (and VB) at http://www.sharpplot.com/Languages.htm. I have a bit of a cold today, so I decided that instead of hopping in an icy car and driving to the office in order to spend the day drinking coffee and answering e-mail, I should stay at home, turn up the radiators, make lots of tea (with honey!) and have some fun writing code on my Raspberry Pi! Can there be a better way to ensure a speedy recovery? 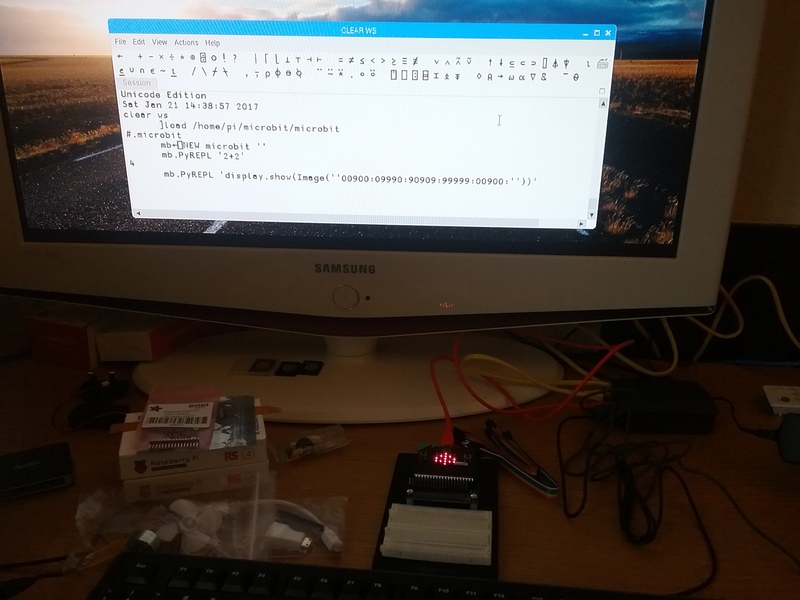 By the way, if you are already a user of Dyalog APL but you haven’t got a Pi yet, you should read The APLer’s Quick-start Guide to the Raspberry Pi, which Romilly Cocking completed a few days ago. This explains what your options are for buying hardware, and how to get going with a free copy of Dyalog APL. If you don’t read it now, your cold may be over before all the bits are delivered, so hurry up! I wasn’t feeling THAT energetic this morning, so I decided to ease back into things by trying to replicate Romilly’s reaction timer, which is written in MicroPython. 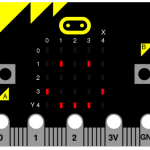 To begin with, I extended the microbit class that I developed for the Morse code display function with a few new methods to cover the API calls that allow me to check the state of the two buttons on each side of the micro:bit display (see the image above). Once this is done, writing the Play function in the ReactionTimer namespace is easy, you can find the rest of the code on GitHub. The APL version is different from the MicroPython version in that – once the user presses button B and stops the game – the reaction times (in milliseconds) are returned as an integer vector. So now we can have some fun with data! Although I might be feeling better tomorrow, I expect to be back soon. I have a couple of plastic bags full of resistors, LEDs, potentiometers and cameras (yes, plural) that I have not opened yet! As mentioned last week, I have found a new way to provide a front end processor for my Pi, the BBC micro:bit. This week, I have started putting the new system through its paces: The microbit class in our GitHub repository has been beefed up to make it more resilient in the case where serial I/O is not initialised, or the MicroPython REPL is not running, and I have added a trivial Python program which can be used to intialise the REPL using the mu editor. 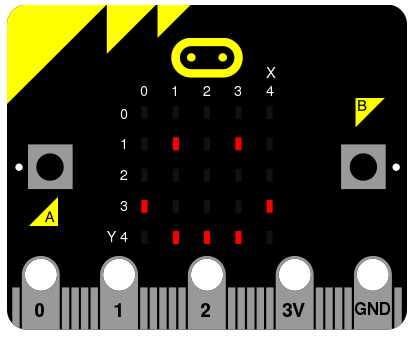 Making calls to the micro:bit API via MicroPython is easier than using GPIO via a C library. Version 15.0 of Dyalog APL contains new system functions for working with text files, so we no longer need the “Files” library, we can just use the built-in ⎕NGET function to read the contents of a file. A couple of years ago I spent many happy hours writing APL code to control robots which each embedded a Raspberry Pi. It was fun but it was a bumpy ride – my interest eventually faded when I discovered that it was just too difficult to make sense of raw accelerometer data, which I was hoping to use for precise navigation. After I managed to fry my MPU-9150, I decided to pursue other interests, as they say. Recently, Romilly Cocking has been waxing lyrical about a number of new components which he thinks will make the whole experience more enjoyable – and I have decided to dive back in. So far, it has indeed been a very pleasant experience. While I was away, the Raspberry Pi and the software available for it have come a VERY long way. The speed of a Pi 3 makes it a perfectly usable computer. 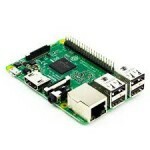 I am writing this blog entry on the Pi using a standard Chromium browser. APL starts up immediately, using our new graphical IDE. It is quite simply amazing! The first generation of APL-based robots used an Arduino to manage the motors and sensors because timing was too critical for the Pi to handle it. I spent some rather unhappy hours writing a control program in C, debugging that without any tools. You could not even do “printf debugging” to the serial port because that interfered with the timing so much that it stopped everything from working. Romilly suggested I take a look at the micro:bit, and since I have been using an interactive REPL all my life, he suggested that I run MicroPython on it. He was right, I’m loving it! I purchased the Kitronik Inventors’s Kit for the micro:bit from Pimoroni, and quickly found videos on Youtube explaining how to assemble it. I installed the “mu” editor on my Pi and was immediately able to edit a simple Python program and run it on the micro:bit. My next step was, of course, to create a little class to drive MicroPython from APL. This involves using serial I/O: when the micro:bit is attached to your Pi via USB it appears as a folder and as a serial (tty) device, typically /dev/ttyACM0. You can find my code in the APLPi/microbit GitHub repository. Which of the Inventor’s Kit experiments would you like to see me do next?